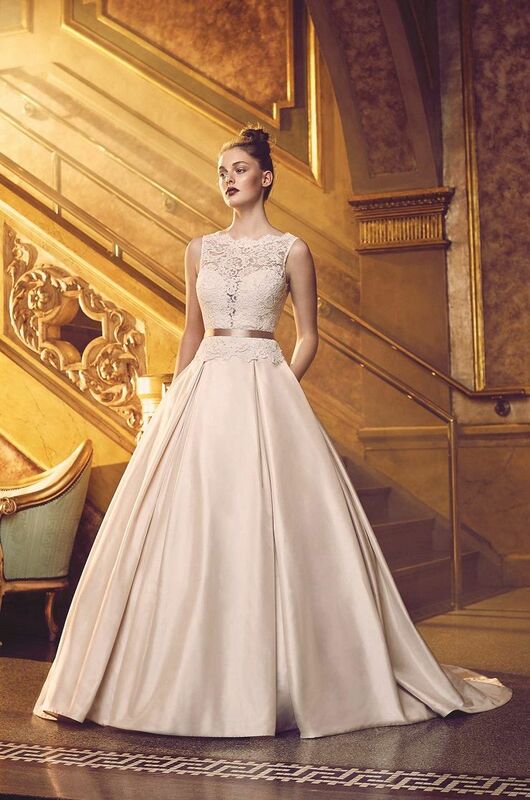 Paloma Blanca fall 2016 wedding dresses revisits Hollywood’s Golden Era with wedding dresses featuring iconic elements of Old Hollywood glamour. These are such sweet and delicate styles with more open back action and French Alençon Lace details to love! With perfectly glamorous silhouettes, sleek designs and stunning details this collection is easily one of our favorites. French Alençon Lace, Tulle, and Organdy Wedding Dress. Strapless lace corset bodice with plunging neckline and lined cups. Fitted lace skirt through the hips with unlined flared skirt in tulle and organdy. Mokuba ribbon with beading tied at waist. Paloma Satin Wedding Dress. Sleeveless crossover V-neckline, empire waist cut bodice in Paloma Satin. Beaded spaghetti straps and satin belt with beaded appliqué at empire waist. Fit and flare satin skirt with Swarovski buttons down entire length of skirt. French Alençon Lace and Tulle Wedding Dress. Strapless corset lace bodice with sweetheart neckline and lined cups. Swarovski buttons along bodice back. Mokuba ribbon tied at waist. French Alençon Lace Wedding Dress. Sleeveless lace cropped top with V-neckline and sweetheart neckline on lining. Swarovski buttons down center back of bodice. Modified A-line lace skirt with scalloped hem. French Alençon Lace and Mesh Tulle Wedding Dress. Strapless beaded lace corset bodice with plunging neckline and lined cups. Mokuba ribbon tied at waist. Full mesh tulle skirt. Paloma Satin and Organza Wedding Dress. Sleeveless Paloma Satin bodice with bateau neckline and double beaded straps. Removable beaded belt at waist. French Alençon Lace and Paloma Satin Wedding Dress. Off the shoulder beaded lace bodice with cap sleeves and modified sweetheart neckline on lining. Paloma Satin waistband with Swarovski button closure. Fit and flare Paloma Satin skirt. Silk Dupioni Wedding Dress. Sleeveless bodice with bateau neckline and double beaded spaghetti straps. Full gathered skirt with hidden side pockets in skirt. French Alençon Lace and Silk Dupioni Wedding Dress. Sleeveless lace bodice with bateau neckline and V-neckline on back. Plunging neckline on lining. Lace appliqué cascading around waistline. Mokuba ribbon tied at natural waist. 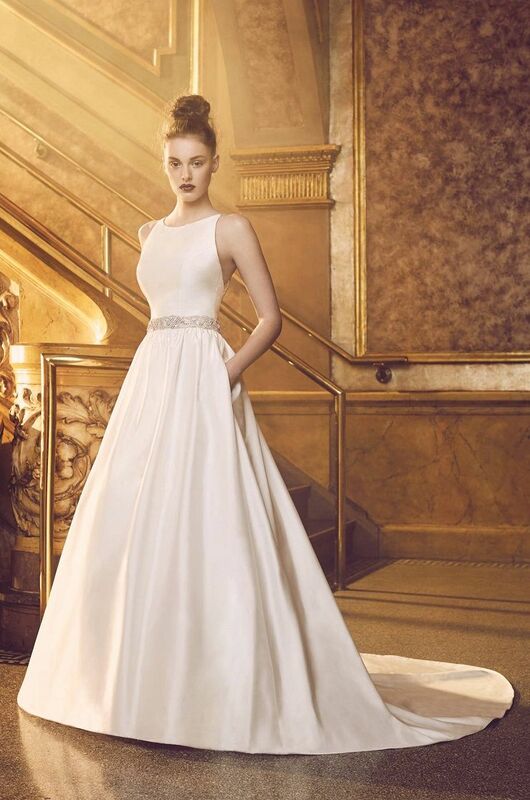 Paloma Blanca Fall 2016 season took classic looks and infused each design with old-school Hollywood appeal, creating gowns that are chic, elegant, and perfectly suited for the modern bride.